"We predict internet advertising to pass three milestones over the next three years," ZenithOptimedia's forecast said. 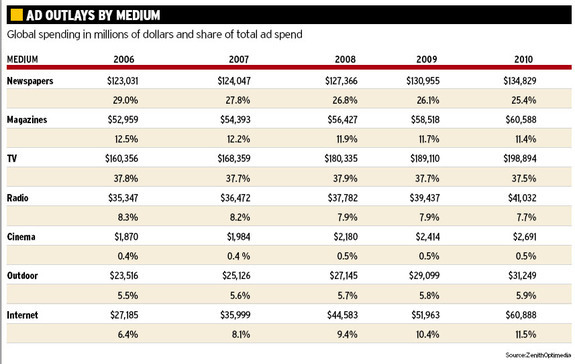 "We expect it to overtake radio advertising in 2008; to attain a double-digit share of global advertising in 2009; and to overtake magazine advertising in 2010, with 11.5% of total ad spend." Use this on a call. A perfect study to show your web laggards. Show them the chart and ask, "Come on guys, do you really think this Web stuff is just going to blow over?